My dad is the best at grilling things. Some of my favorite times are our family cookouts with dad at the grill. I guess that’s why I smiled when I saw these on Pinterest the other day. There are a ton of variations on these- they are all over the web. 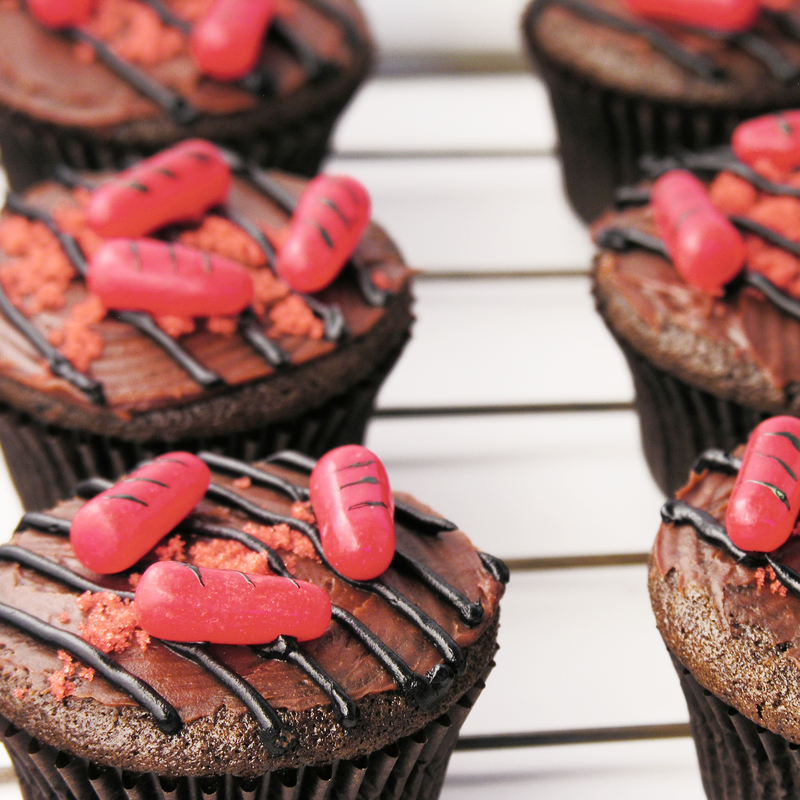 There are steaks and burgers made out of caramels and candy bars. There are shish-kabobs made out of Dots candy and Starburst. I even saw goldfish crackers on the “grill”! LOVE IT! I stayed with Hot Tamales as little hot dogs, and they make me smile. These are easy and fun, fun, FUN!! 1 box of Hot Tamales candies (if you hate cinnamon, you can use Mike&Ikes candy, but you’ll have to pick out the cherry ones). Make cake mix according to package and divide into 24 cupcake liners placed in muffin tins. Bake according to package, remove from oven and cool completely. 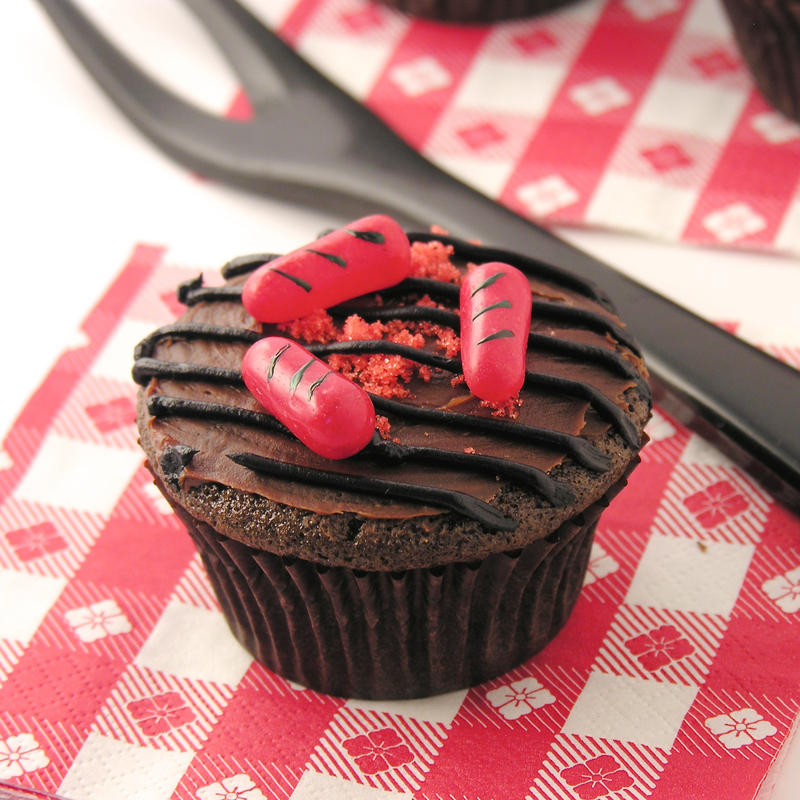 While cake is baking, use a toothpick and black food color gel to draw grill lines on the hot tamales. I placed them on a paper towel to dry, so they wouldn’t roll. Take about 1/3 of frosting out of tub, place it in a separate bowl, and add black food coloring gel to make the frosting black. 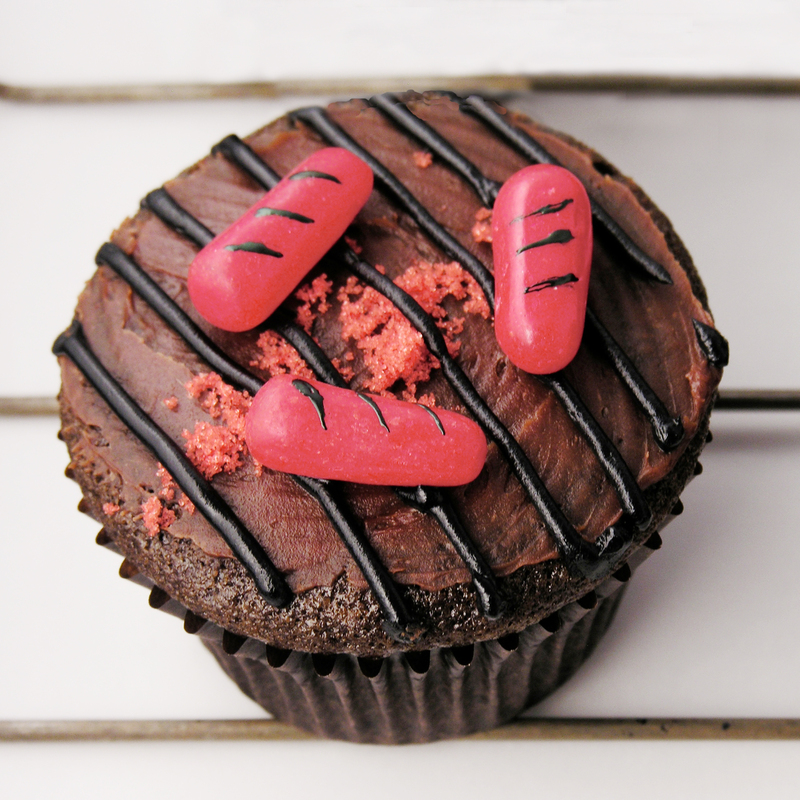 Place this frosting into a small zip-top bag fitted with a small round decorating tip. 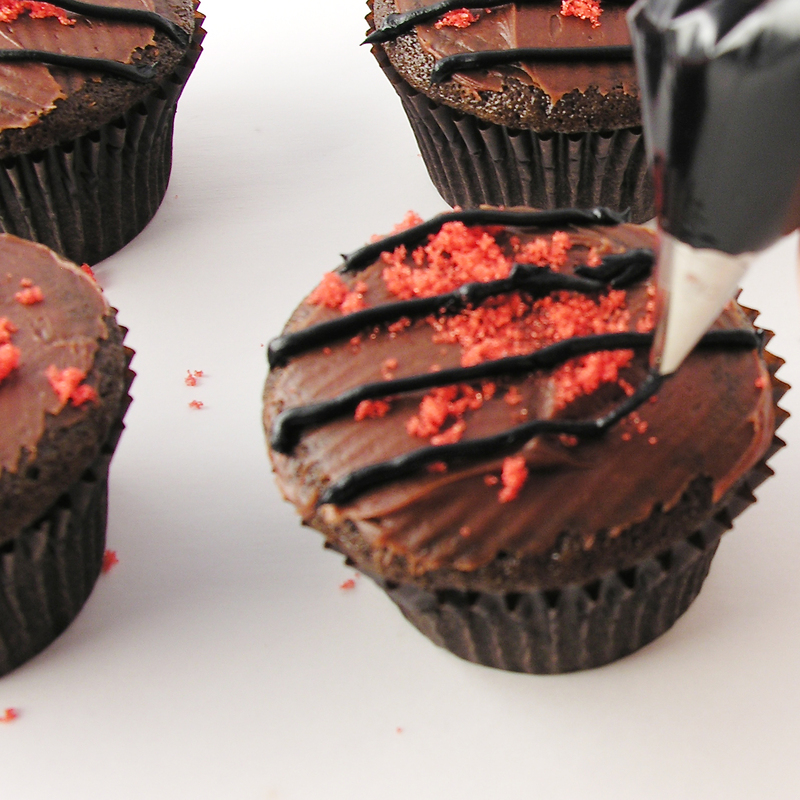 Once cupcakes have cooled, use a knife to frost a thin, smooth layer of the chocolate icing onto each cupcake. 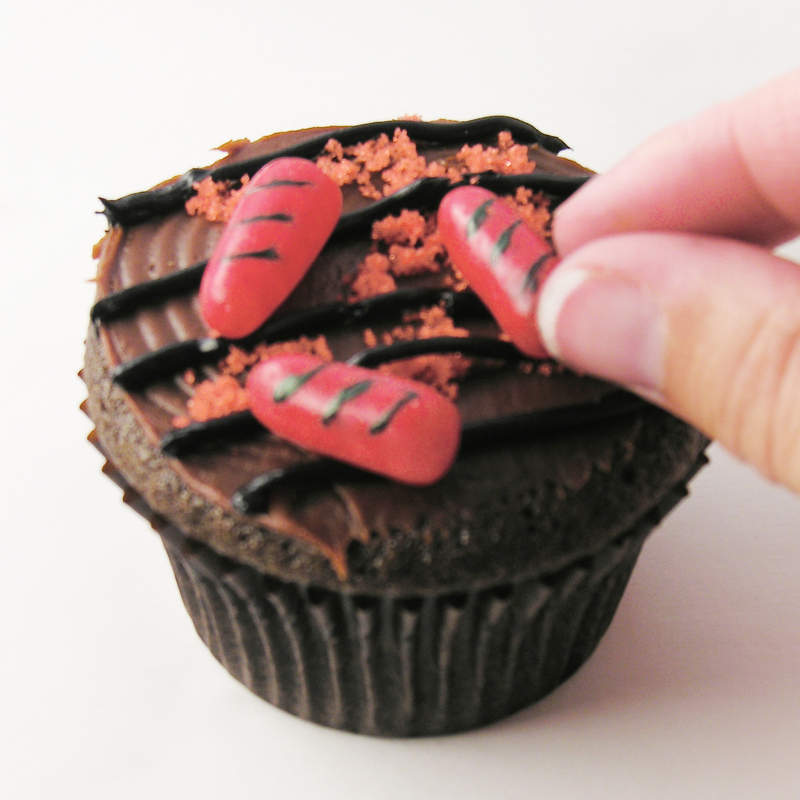 Sprinkle a little red sugar in the middle of the cupcake frosting. Pipe black frosting on in even lines to make the grill. Set Hot Tamales on the “grill” top. Posted in Cupcakes and tagged baking, BBQ, best, chocolate, creative, cupcakes, dessert, Father's Day, food, grill, hotdogs, party, recipe, tailgate party. Bookmark the permalink. Oooh they seem like fun 😀 now you made me curious about your BIG news! This is such a good idea- they look great! I’m glad you are going to try them- they are really fun to put together!! Thanks for stopping by!! That is so clever. Thanks for sharing. Thank you~~and you are so welcome!!!! Awww too cute! I love the little sausages! What a fab idea. Question though, what’s the yield for this recipe? Sure- 24 cupcakes. Thanks for stopping by!! !